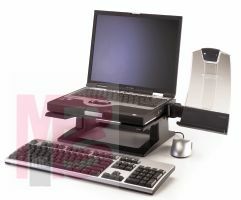 3M LX500 Adjustable Notebook Riser - Micro Parts &amp; Supplies, Inc.
Raise your notebook to an ergonomically correct height. Height adjustable from 4 to 6 inches. Cable management feature helps keep your cables under control. Holes in platform help keep notebook ventilated.